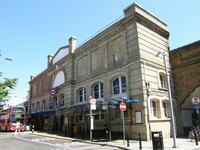 Putney Bridge Bus Station is closed to all traffic from 1 August 2011 while improvements are made to both the bus and Underground stations. These works are due to be completed by late September. The work at the bus station involves repairing and resurfacing the entire roadway as well a major upgrade of the drainage system. TfL say that this will significantly reduce the need for future bus station maintenance closures meaning less inconvenience for passengers. While this work is being carried out London Underground will be upgrading the power supply to Putney Bridge Underground Station. By linking these works into the bus station improvements TfL will be able to minimise any long term disruption in the area. Details of stopping arrangements during the works will be available at local bus stops, around the bus station and at tfl.gov.uk/livetravelnews Bus station staff will also be available to advise passengers of where to catch their bus.